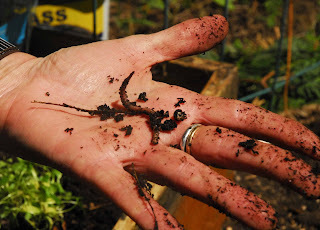 Ask the Yogini: Pointing at the earthworm in the palm of your hand: wake up! Pointing at the earthworm in the palm of your hand: wake up! The goal of yoga is to awaken. Awakening comes by many different paths and in many different flavors. The path may be long and toiled or sudden and unexpected. We might just open our eyes one morning and notice the intoxicating beauty of the earth and be struck into awakening. We might hear the song of birds or the screech of a raptor and know peace. We might take a deep breath of the perfume of the garden and be swept into ecstasy. We might hold an earth worm in the palm of our hand and know that we are one. Each moment is an opportunity to wake up. Your awakening might be a bud beginning to make itself known or it might be a lightening bolt ready strike. There are many opportunities to be wake up. Yoga is an arrow pointing the way. Yoga gives us the tools to be awaken each moment. Today's practice: Take a deep breath. Look around you. Feel your skin on your body. Notice any tension you are holding and invite it to melt. Let the melted tension flow down through your body and out through the soles of you feet. The earth will absorb everything you give it. Breath into your wounds and injuries: the metaphoric and the physical wounds, the wounds of your psyche and your body. Let your breath expel the thorns that your flesh is holding and melt the structures you have built to protect the thorns. Give the thorns of your flesh and all the pain you are holding to the earth. Make it an offering. Water the earth with your tears. Now take an even deeper breath than the one you started with. Fill your body with space. Follow your exhalation to the tip tail of its ending and then receive another complete and full inhalation. Continue with deep, long and slow breath cycles. Make sound on your exhalations: sighs, growls, groans, moans whatever you need to increase your internal space, to expel any remaining thorns or toxins. Close you eyes as you do this. When the sounds subside enjoy the silence, let your breath slowly return to normal. When you open your eyes lift them off the computer screen and look around you. Take in the wonder of where you are and what you see. Jump up and live again!